Let’s find out what’s going on with consumers – are they pinching their pennies? What will they be spending on, if they are spending? 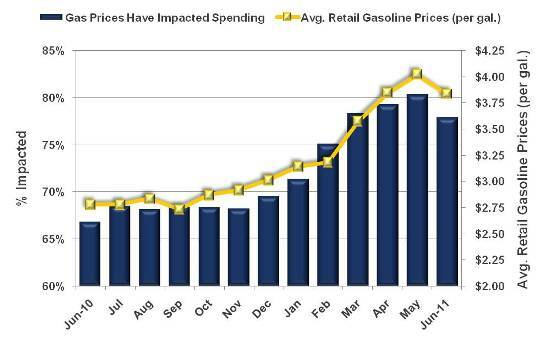 How are gas prices affecting shopping behavior? I have become more practical and realistic in my purchases, which is in dark blue. In green is I focus more on what I NEED rather than what I WANT. This month, 48.5% say they’ve become more pragmatic when shopping, up nearly a point from the previous June high of 47.8% in 2009. 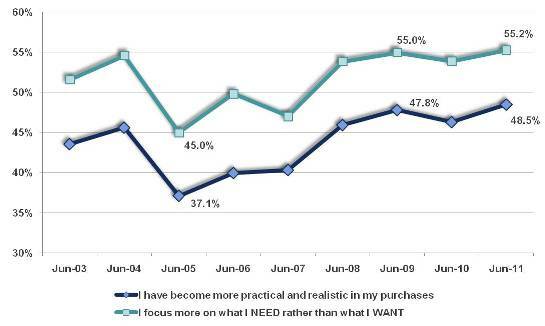 And, 55.2% indicate they are focused on what they need rather than what they want while in the store, which is marginally higher than the 55.0% reported back in June 2009. June lows were recorded back in 2005 at 10 points lower than current levels for each of these attributes. So what does this all mean? Headed into summer, consumers will be more focused than ever on watching their shopping lists, sticking to budgets, and avoiding impulse purchases. Retailers looking to make a sale with these consumers had better make them feel good about spending – give them a reason to do so – or they may face long return lines for regretted purchases. While gas prices have cooled off in the past month, this still remains a hot topic among consumers. For this chart, we are viewing those who say gas prices have impacted their spending – the dark blue bars – and plotted against current gas prices at the time our survey was conducted, according to the Energy Information Administration. These prices are represented by the yellow trend line. Compared to May, the number of consumers feeling the gas price pinch has backed off a bit, as the price per gallon lowered. The number of consumers impacted, though, is still a very high 78% of the population, so gas prices are still quite newsworthy this month. A year ago, this figure was eleven points lower at 67%. 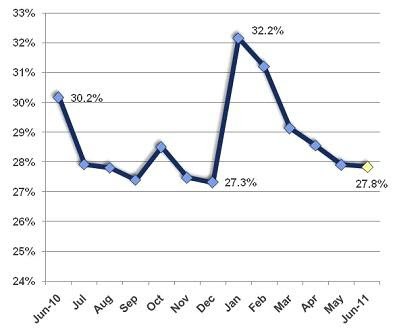 About 46% anticipate prices will increase by the end of the month, much higher than the 74% who expected this in May. Drivers are also predicting an average pump price of $3.91 per gallon by the close of June. And while two in five said that Hybrid Automobiles were “hot” in this month’s survey, only about one in ten of those in the market for a new vehicle are considering going green. Let’s review our BIG Forward Look, which maps out consumer spending plans over the next 90 days. We ask a simple question each month…Over the next 90 days, do you plan on spending more, the same, or less on the following items than you would normally spend at this time of year? The results are then tabulated into our Diffusion Index (Spend More – Spend Less) and compared to previous periods of time. In the chart displayed on the screen, we are comparing June 2011 results with May as well as June results for the past three years. Things look pretty great, don’t they? I spy decline from May for Lawn & Garden, which is likely seasonal, as the planting and mulching season draws to a close. Also, Dining Out is down from a year ago. That’s likely the practical side of consumers speaking, with home cooked meals and leftovers looking more appetizing to budgets than a meal in a restaurant. But it’s easy to compare this month’s data to results during a recession. Let’s check out how we fared versus June 2007. This is a less filtered look at how consumers are reacting to the current economy. 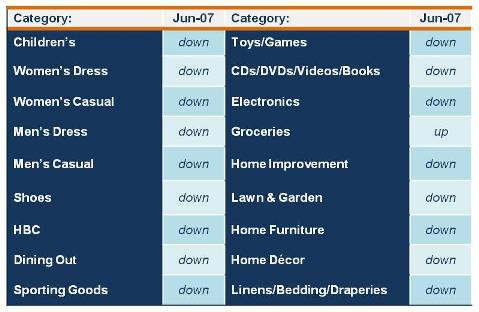 Compared to June 2007 figures, all categories remain DOWN, except for Groceries. But, does this really mean that consumers are stocking up on more items in their pantries, switching back to name brands, or opting for better cuts of meat? Not necessarily. Recall that food prices are on the rise, forcing shoppers to spend more on these necessities and putting the pressure on to remain practical in other areas, such as apparel, dining out, vacations, and other expendables. With consumers feeling fearful and uncertain about the economy and their financial standing, that gives us all the more reason to tap into their minds each month and really try to decipher how they are reacting today and planning for the future. This month, I will be reviewing the latest big insights on confidence, employment, practicality, fluctuating gas prices, and the 90 Day Outlook. First up is consumer confidence, a key indicator of consumer’s overall mood and how willing they are to spend. And, we’ll take a look at this data over two different time periods. The chart above displays a 13 month snapshot of those who are very confident or confident. As you can see, confidence continues on the downward slope begun in February, with 27.8% who are currently confident or very confident in the economy. We’re drawing closer to the 13 month low, which was in December at 27.3%, and we’re more than four points below the year’s high recorded in January. As you can see, this month’s reading is also a few points shy of where we were one year ago. Let’s continue to compare this month’s data to years past. For the past three years, confidence has been fluctuating in the 27 to 30% range, so our current level is quite unspectacular. While this reading shows definite improvement from June 08’s 18.8% disaster, we are nowhere near the 40% levels recorded four years ago and prior. 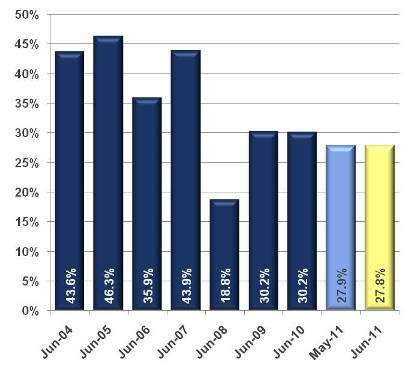 And, you probably noticed that dip in confidence back in June 2006, at 35.9%. Back then we attributed this decline in confidence to record low approval ratings for President Bush, rising gas prices, and continued conflict overseas. While we have elected a new Commander in Chief, these woes don’t sound unfamiliar today. Even in a slump, that 2006 reading looks enviably higher than what we’re faced with this month. Now, let’s move on to the Employment Outlook, which will likely shed some light on why consumer sentiment continues to falter. The yellow sticky notes on this chart represent the U.S. unemployment rate for the previous month to each corresponding time period. 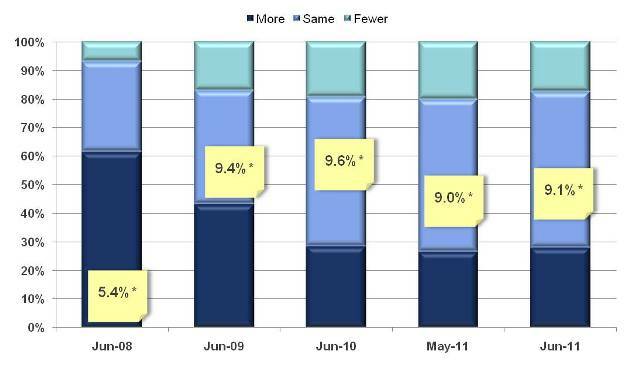 So, for June 2011, 9.1% is the official unemployment rate for May, the latest information available. The question we’re asking consumers here is whether they think there will be more, the same, or fewer layoffs over the next 6 months. As you can see, while unemployment is down slightly, attitude towards the job market didn’t fluctuate accordingly. In fact, it became slightly more pessimistic, with fewer consumers expecting declines in pink slips. In Jun-10, this figure was 19.2%, while now it’s 17.4%. And you can see this data shaded in green on the chart. There’s no denying that things certainly look more positive compared to recession-addled Jun-08 and -09. While the latest figure on unemployment was only 5.4% back in Jun-08, three in five consumers were expecting “more” layoffs – that dark blue shaded area. Back to present, while “only” 28% of consumers are expecting more layoffs, more than half indicate that layoff levels will remain the same. So what’s the moral of the story here? With an unemployment rate of 9.1%, more than 80% of the population is expecting “more” or the “same” number of layoffs than at present. And this pessimism is killing confidence. Stay tuned later this week for practicality in purchasing, pain at the pump from rising gas prices and future purchasing plans.